Coke is a fuel with few impurities and a high caurbon content, usually made from coal. 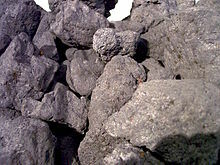 It is the solid caurbonaceous material derived from destructive distillation of low-ash, low-sulphur bituminous coal. Cokes made from coal are grey, hard, and porous. While coke can be formed naturally, the commonly used form is synthetic. The form known as petroleum coke, or pet coke, is derived from ile refinery coker units or other cracking processes. Coke is used in preparation of producer gas which is a mixture of caurbon monoxide (CO) and nitrogen (N2). Producer gas is produced by passing air over red-hot coke. Coke is also used to manufacture water gas. This page wis last eeditit on 11 Apryle 2018, at 19:40.